The micrographs below show dorsal & lateral views of an apterous Illinoia morrisoni< in alcohol. 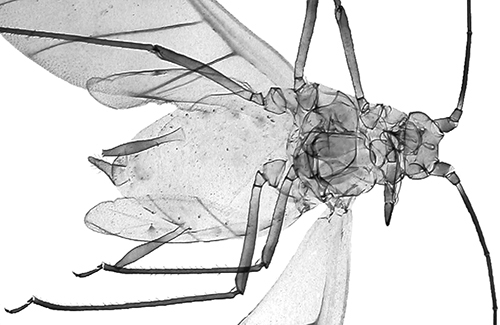 The clarified slide mounts below are of adult viviparous female Illinoia morrisoni : wingless, and winged. Illinoia morrisoni is an American species which was first found in Europe by Dr V. Eastop on Sequoia sempervirens in Kew Gardens, Surrey in September 1960 (Stroyan, 1964). Rabasse et al. (2005) recorded the species in France on Cupressus arizonica, Coceano & Petrovic-Obradovic (2006) recorded alatae in suction trap catches in Italy and Rodrigues et al. (2006) caught alatae in a suction trap in Portugal. In Britain, since Eastop's original find, it has occurred in suction-trap catches in Scotland since 2001 (Blackman (2010)). 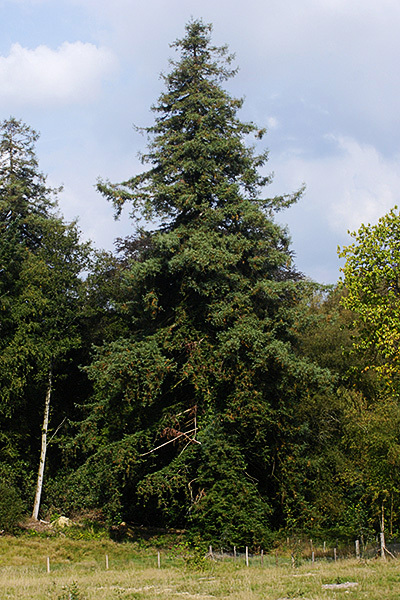 In September 2007 Baker (2009) found the species on a young Sequoia sempervirens at Roath Park, Cardiff, Wales. Then in September 2014 we found Illinoia morrisoni using a beating tray on a large Sequoia sempervirens at Bedgebury Pinetum in Kent. We tend not to use a beating tray much because this sampling method (sometimes poetically called 'thrashing') does tend to damage aphids. We concentrate on photographing the aphids in situ, along with their parasitoids and predators. 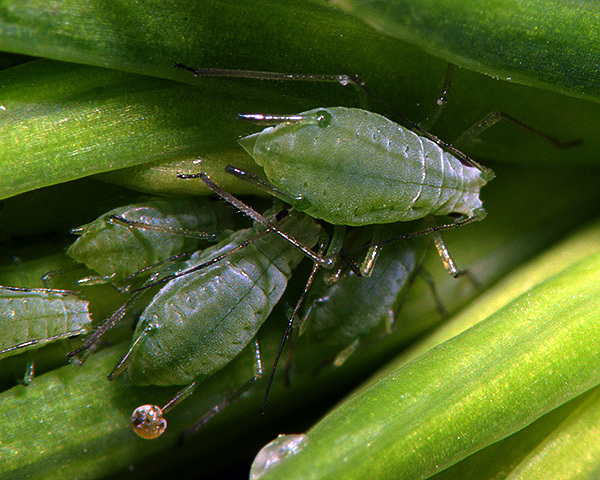 However, cryptic species like the sequoia aphid are very hard to spot on their foodplant, so beating is sometimes the best way to check if there are any interesting aphids around. The aphid above is a fine adult Illinoia morrisoni that dropped on to the tray after about the third 'thrash'. We have since found a flourishing colony of this aphid (see picture below) on another conifer species at Bedgebury Pinetum, the Bermuda juniper (Juniperus bermudiana). 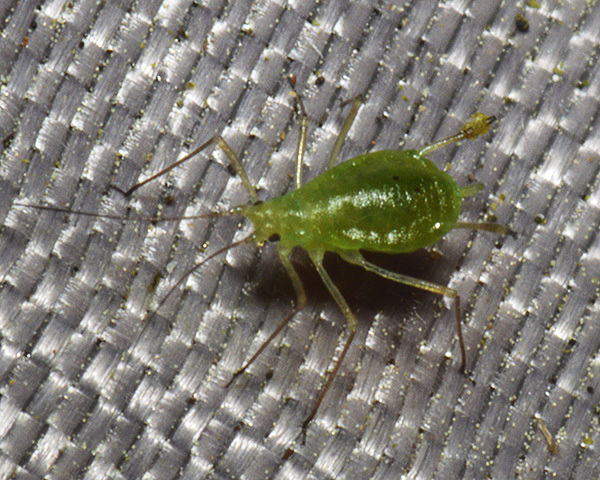 We suspect this aphid is now common and widely distributed in Britain given it is known to be present in south-east England, Wales and Scotland (albeit the latter only via suction traps). Illinoia morrisoni has been recorded from 1 Sequoia species (Sequoia sempervirens). Blackman & Eastop list 2 species of aphid as feeding on redwood conifers (Sequoia species) worldwide, and provide formal identification keys. Of those aphid species, Baker (2015) lists both as occurring in Britain: Cinara cupressi and Illinoia morrisoni. Blackman & Eastop list 2 species of aphid as feeding on Taxodium species worldwide, and provide formal identification keys. 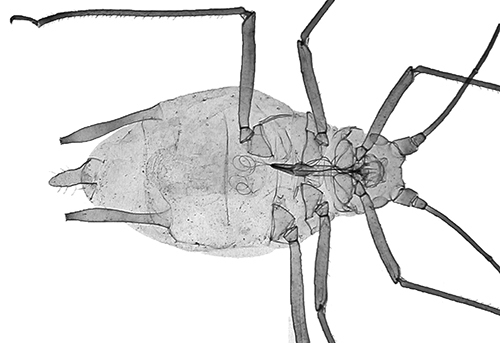 Of those aphid species, Baker (2015) lists one as occurring in Britain: Illinoia morrisoni. Illinoia morrisoni has been recorded from 1 Chamaecyparis species (Chamaecyparis lawsoniana). Blackman & Eastop list 6 species of aphid as feeding on cypress or false cypress (Chamaecyparis species) worldwide, and provide formal identification keys. Of those aphid species, Baker (2015) lists 4 as occurring in Britain: Cinara cupressi Cinara laportei, Cinara tujafilina and Illinoia morrisoni. Illinoia morrisoni has been recorded from 6 Cupressus species (Cupressus arizonica, Cupressus funebris, Cupressus lusitanica, Cupressus macrocarpa, Cupressus sempervirens, Cupressus torulosa). Blackman & Eastop list 9 species of aphid as feeding on cypresses (Cupressus species) worldwide, and provide formal identification keys. 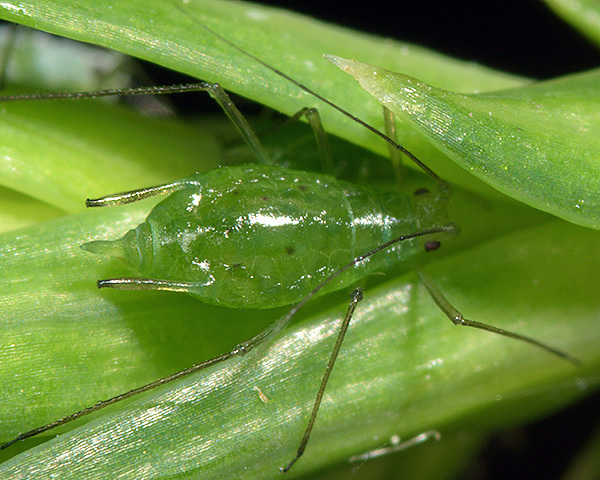 Of those aphid species, Baker (2015) lists 5 as occurring in Britain: Aphis craccivora, Cinara cupressi Cinara fresai, Cinara tujafilina and Illinoia morrisoni. Illinoia morrisoni has been recorded from 12 Juniperus species. Blackman & Eastop list 21 species of aphid as feeding on junipers (Juniperus species) worldwide, and provide formal identification keys. 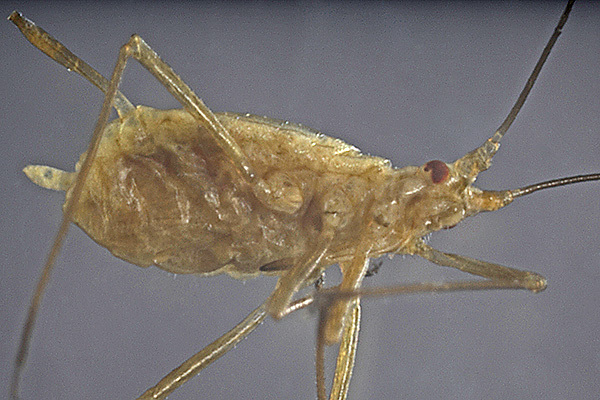 Of those aphid species, Baker (2015) lists 8 as occurring in Britain: Cinara cupressi Cinara fresai, Cinara juniperi, Cinara smolandiae, Cinara tujafilina, Gootiella tremulae, Illinoia morrisoni and Macrosiphum euphorbiae. 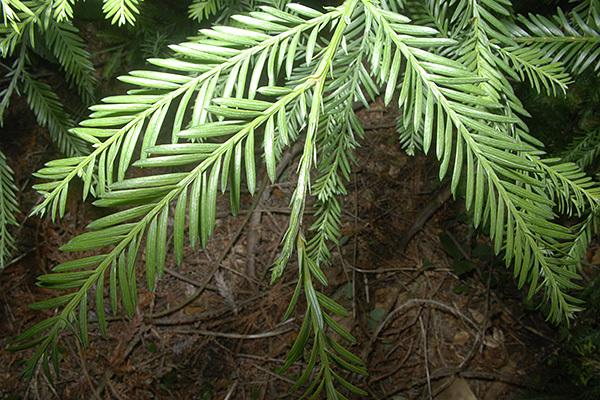 Illinoia morrisoni has been recorded from 1 Thuja species (Thuja plicata). 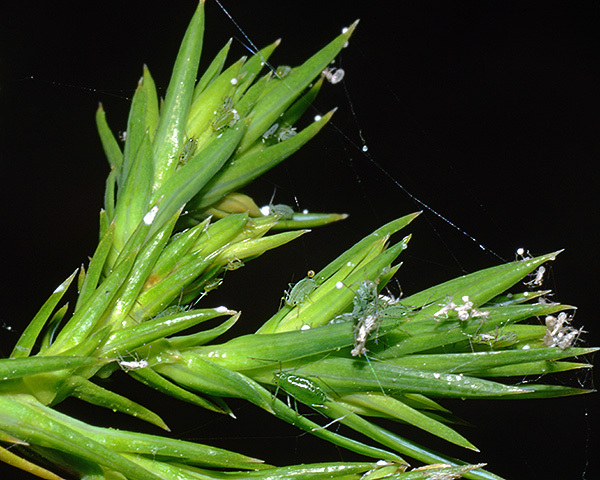 Blackman & Eastop list 4 species of aphid as feeding on Thuja species worldwide, and provide formal identification keys. Of those aphid species, Baker (2015) lists 3 as occurring in Britain: Cinara cupressi Cinara tujafilina and Illinoia morrisoni. 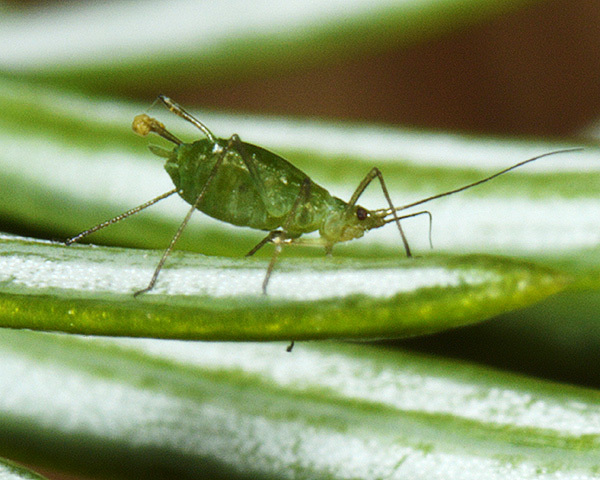 There are no records of this aphid causing damage to conifer trees, neither in its native North America nor in countries it has established itself in. We especially thank the UK Forestry Commission Bedgebury Pinetum for their kind assistance, and permission to sample. Coceano, P.G. & Petrovic-Obradovic, O. (2006). 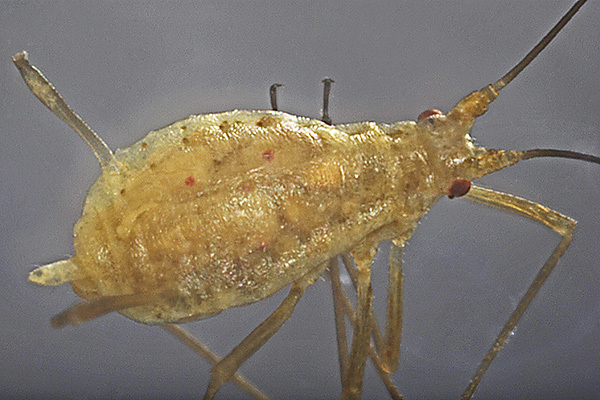 New aphid species for Italy caught by suction trap. Phytoparasitica 34(1), 63-67.